Among the many debates occurring across the Navy in the wake of the USS FITZGERALD and USS JOHN S. MCCAIN collision mishaps of last summer is whether or not the Surface Community should continue with the unit-level XO/CO Fleet-Up policy. Strong, considered opinions exist on both sides of the issue as thoughtful professionals seek to settle the question regarding the value and future of the policy. Although many factors should be considered, the first question the Surface community should ask is whether the XO/CO Fleet-Up policy contributes to the imperative of operational competence, which I define as the ability to handle and fight a ship at sea safely and effectively. This is the gold standard by which we measure success and should be the first test for whether the Fleet-Up policy should continue. In my view, unit-level XO/CO Fleet-Up comes with great benefits that contribute to operational competence, with the caveat that certain potential risks must be addressed to ensure the best possible outcomes. As someone who has participated in both the “traditional” and Fleet-Up models, in addition to leading a squadron of ARLEIGH BURKE Destroyer (DDG) Commanding Officers (CO) and Executive Officers (XO) through the process, my perspective is that the XO/CO Fleet-Up model works. I was XO in USS PORT ROYAL (CG-73) for 22 months from 2004 – 2006 and screened for O-5 Command during that tour under the traditional command screening process. Following a 27 month shore tour, I received orders to USS STETHEM (DDG-63) as the first XO/CO Fleet-Up in Commander, Destroyer Squadron 15 (COMDESRON FIFTEEN) forward deployed to Yokosuka, Japan. I spent 12 months as XO in STETHEM then fleeted-up to CO for the next 18 months for a total of 30 months in the command leadership team. More recently, I reported to CDS-21 in March 2015 as Deputy Commodore, fleeted-up in August 2016, and am currently in my 19thmonth as Commodore. During my time as Commodore, I have worked with, led, and observed as many as eight Fleet-Up XO/CO teams at a time. Like any policy, XO/CO Fleet-Up has its benefits and risks. The three greatest benefits with regard to operational competence are leadership consistency for the crew, CO’s knowledge of the ship, crew, and mission, and the CO’s readiness to command with confidence on day one. Leadership consistency results from the stability and longevity in the XO/CO team that the notional 36 month Fleet-Up tour provides. Because the XO will presumably one day become the CO, and the CO has to live with the outcomes of decisions made while XO, the leadership “diad” is incentivized to be more thoughtful and consistent in executing shipboard management, including key programs such as training and maintenance that have a direct impact on a ship’s operational effectiveness. A CO’s knowledge of the ship, crew, and mission benefits greatly from XO/CO Fleet-Up. After having served as XO for 18 months, the new fleet-up CO has intimate knowledge of the ship and crew. Individual strengths and weaknesses, troubled systems, and the myriad other challenges that face a ship CO will be well-known as a result of having spent the previous tour as XO dealing with those issues. This effect of carrying the knowledge of ship, crew, and mission from XO to CO within the same lifelines is particularly helpful given the growing complexity in ship systems and mission areas over the years. Ballistic Missile Defense ships in particular benefit from the Fleet-Up policy because of their technical complexity and unique training requirements. The final major benefit of XO/CO Fleet-Up is that COs report for duty ready to lead with confidence on day one in command with a flatter learning curve as they proceed through their tour. As the previous XO, the new CO comes aboard with knowledge of the ship and crew and, thanks to the quality training provided during the approximately three-month PCO period, is immediately prepared to command. Although there are clear benefits to operational competence inherent in the XO/CO Fleet-Up policy, there are also potential risks that must be addressed to better support operational competence. Those risks include CO fatigue, CO quality control, and time between Department Head (DH) and XO sea tours. The notional Fleet-Up tour length is 36 months. Candidly, this is a long time to shoulder the workload associated with being the XO followed immediately by assuming the inescapable, 24/7 responsibility and accountability inherent in being the CO. I spent 30 months as an XO/CO Fleet-Up, and I was frankly exhausted by the end. I had no chance to rest and reset prior to assuming command. This is the fatigue risk inherent in the Fleet-Up policy: that COs may burn out while in command and, as a result, will be at greater risk of making bad decisions at sea. Fortunately, this concern has been addressed with recent policy. In 2016 the Surface community implemented the “18-3-18” policy refinement to Fleet-Up, which requires a three month break between XO and CO tours and affords PCOs the opportunity to take up to 30 days of leave. This policy was enacted in part to allow future COs to recharge prior to assuming command. 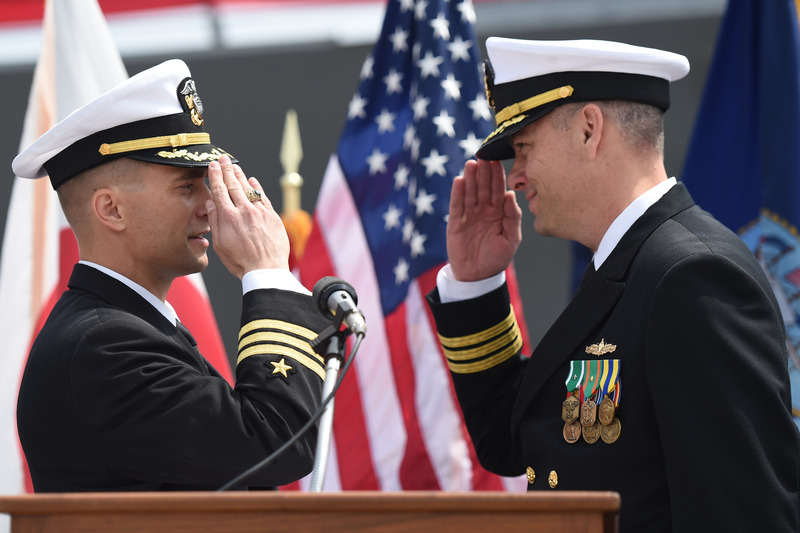 In addition, that three month period ensures that PCOs complete additional required pre-command training at the Surface Warfare Officers School (SWOS) in Newport, RI. The shift to XO/CO Fleet-Up resulted in the perceived loss of quality control by removing a long-standing checkpoint on the path to command: the traditional XO ride. Before Fleet-Up, COs had the final say on whether their XOs were fit for command. The XO Fitness Report (FITREP) was a “one or a zero” and had tremendous influence on command screening boards, which typically occurred late in an XO’s tour or during the follow-on shore tour. The “bit check” still exists in the Fleet-Up policy. Now, it is designed to occur during the XO tour when, in order to move on to command, the XO must receive positive endorsement from the CO, ISIC, and Type Commander. Additionally, the Fleet-Up selection board uses the same key inputs (Department Head FITREPs), career timing (the first look occurs two years after O-4 selection), and is actually more selective than the traditional process because it screens fewer officers for command rather than creating a larger XO bank that must then be culled to identify future COs.
To further reduce risk from quality concerns, the Surface community has modified the Fleet-Up policy over time. Quality checkpoints now include the requirement to pass the Command Qualification Assessment (CQA) – a rigorous process that takes place at SWOS – as a prerequisite for command screening board eligibility; mandatory Command Qualification Board (CQB) topics to standardize criteria for command endorsement; and a ship handling go/no-go test during the first two days of the Surface Command Course. The go/no-go test is a recent addition to the Fleet-Up quality control process. Notably, PCOs must demonstrate proficiency in ship handling and the Rules-of-the-Road or risk being sent back to their ISIC for remediation or, more likely, loss of command opportunity and administrative reassignment. I currently have three PCOs in CDS-21 preparing to assume command later this year; they all report the go/no-go test is challenging, fair, and provides excellent feedback. Excessive time between DH and XO tours remains the greatest potential risk to operational competence inherent in the XO/CO Fleet-Up policy. Shortly after implementation of Fleet-Up, the average time command-screened officers spent between the end of their DH tour and reporting aboard as XO spiked to as high as seven years, the result of screening to opportunity and not the Fleet requirement, resulting in a large bank of command-screened officers waiting for orders. This inordinate delay in returning to sea was never part of the original Fleet-Up policy, which anticipated a 5 – 5.5 year pause. The unintended extended delay between operational tours set officers up to enter the Fleet-Up program with low proficiency and lack of confidence. In contrast to the traditional approach of command selection, which averaged 3.5 – 4 years between XO and CO tours, the Fleet-Up policy sought to accept risk earlier, namely between DH and XO tours, thereby ensuring a direct transition from XO to CO with the attendant benefit to operational proficiency. Today, the average time between DH and XO is down to 5.3 years and trending back to the 4.5 – 4.7 years as originally envisioned. It is clear from attending waterfront briefs that Surface community leadership recognizes the importance of reducing the time between DH and XO and is actively working to shorten it. If the Surface community can get that gap back to a reasonable length of time so that degradation in operational skills is not a major concern, then the risk will have been mitigated. Among the three risks identified above – CO fatigue, quality control, and time ashore prior to XO – quality control presents the biggest challenge. Managing the potential impact of fatigue is a simple matter of policy (the three months in the “18-3-18” plan) and one that the Surface community has already implemented. The same goes for reducing the time between the end of a DH tour and the start of XO/CO Fleet-Up. Policy can, and I believe will, fix that. Quality control is another matter because it requires the consistent, combined efforts of selection boards, SWOS, unit COs, and ISICs to hold the line on standards and weed out underperformers before they get to command. Based on my experience as the ISIC for CDS-21, in working with my COs, and observing my peers, I am convinced that the Surface community is on the right track with regard to quality control on the path to command. My fellow ISICs and their COs are not afraid to prevent underperforming DHs or XOs from moving on to command. During my current tour as Commodore, I failed two candidates at their CQBs and I declined to fleet-up one of my XOs. In the case of the XO, the CO and I had the full support of both operational and administrative chains-of-command. My COs have collectively Detached for Cause four DHs, removing them from their assignments and essentially closing the door on any opportunity to screen for command in the future. In short, I see Surface community leadership at all levels moving out on implementing or executing policies to drive higher standards and quality control in the Fleet-Up model. I also see a general commitment to removing underperformers at every stage of the SWO career path. The unit-level XO/CO Fleet-Up policy contributes to operational competence for the reasons discussed, namely consistency in shipboard leadership, the CO’s intimate knowledge of the ship, crew, and mission, and CO’s readiness to command on day one. The combination of these three factors set the conditions for a CO who is ready to operate his or her ship competently and confidently and lead the crew to achieve the combat readiness the Surface community expects and the Navy requires. We will not see these positive outcomes, however, unless we address the risks associated with Fleet-Up. To get after those risks, the Surface community must continue to implement and lock in the various quality control points to ensure we select and train the best available candidates for command-at-sea. An attrition model should be applied at every quality checkpoint, and we should be unapologetic about this. Any competitive system that prizes high performance relies on attrition to screen out underperformers and, equally important, demonstrates a commitment to excellence to our high performers. Finally, the Surface community should continue to screen officers for XO/CO Fleet-Up based on Fleet requirements and return the length of time between DH and XO tours back to the originally envisioned limit. If we continue to invest in the benefits of Fleet-Up and fully commit to mitigating the risks, the Surface community and the Navy will gain COs with greater operational competence, who stand ready to lead their crews and employ their ships with skill and confidence.